Want a pressure washer brand for home use? The best AR Blue Clean pressure washer may be what you need. Read on and find out which model suit your needs. Keeping everything clean at home is a challenging task, most especially if you do not have any household help. Worry no more! I gladly introduce to you the best AR Blue Clean pressure washer. The AR Blue Clean pressure washer is considered an essential tool in every household due to its ability to quickly remove molds, grime, and dirt that gives your home a clean and fresher look. Big thanks to its innovative technology! 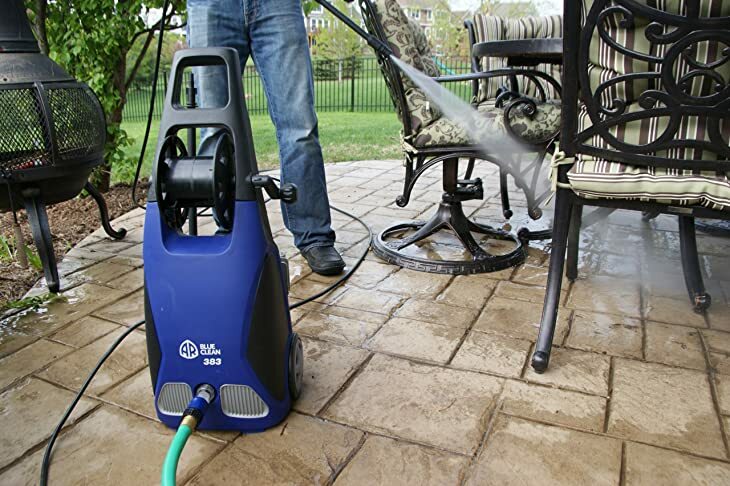 I have listed down the top 5 AR Blue Clean pressure washer in this article and their features. Use it as your guide in choosing the best AR Blue Clean pressure washer that best suits your cleaning needs. Here is a short glimpse of the top 5 AR Blue Clean Pressure Washers for you to be familiar with them. Why Choose AR Blue Clean Pressure Washer? What other people do not know is that the Annovi Reverberi or popularly known as AR has been in the high-pressure pump industry for 60 years. Since 1958, they continuously come up with innovative solutions; thus, the series of Blue Clean pressure washers is born. The AR Blue Clean pressure washers are easy to use. I have tried using the AR383 model before, and I swear by its ease of use – from the assembly of the machine out from the box to connecting the hose and even moving the machine itself. The product delivers an impressive power without producing unnecessary noise. Consumers can use the product without worrying that they might wake family members or the occupants nextdoor. I have actually recommended this brand to my brother who live in a small apartment in the city. Pressure washers from the AR Blue Clean series are made out of high-quality materials, and it is proven that it can stand the test of time. The company has a reliable customer support. They have been prompt in taking requests, answering my queries, and even processing component replacements. The aim of the AR Blue Clean pressure washers is to provide a long lasting service in the household. They have 45 Blue Clean pressure washer accessories that you can choose from for better pressure washer performance. Let us take a look at the five most popular AR Blue Clean pressure washer accessories. This Universal Replacement Kit serves as a backup plan for the pressure washer. So, whenever any of the parts are broken or damaged, but you are in dire need to use your pressure washer, this kit is your savior. Have an easy pressure washing experience with the Quick Connect (QC) filter and Garden Hose Adapter (GHA) kit. Just simply connect the QC filter to the pressure washer water inlet and connect the GHA from the garden hose to the pressure washer. With the kit attached, you can make use of the pressure washer without the need to turn the water on and off. Also, the QC comes with a filter to get rid of impurities that might damage the pressure washer. This accessory works well with the AR Blue Clean pressure washers. This is great for those who intend to use their pressure washer for car washing. It produces thick, clinging foam and eliminates the dirt on your vehicle. You can actually give your vehicle a “touch-free” wash, thus avoiding any potential scratches. Keeping the pump’s internal parts lubricated and sheltered from freezing. It also aids in protecting the pump from internal corrosion such as the build-up of water deposits. It can treat different sizes of the pressure washer. It also cleans out mineral deposits. It preserves pistons and seals. It can also be used in treating hard water areas on warm weather. I highly suggest you get this one. I swear you’ll be thanking yourself for doing so, especially when winter comes. Have a splash-free cleaning of patios, driveways, and decks with the AR patio cleaner. The 10 inches cleaner can clean flat surfaces for about 60-80% faster and provides an even and smooth cleaning. This is a great accessory for cleaning wooden decks and stained wooden surfaces. When cleaning wooden deck surfaces, it is better to invest in a surface cleaner to avoid damaging the wood material. In this section, we will take a closer look at my top 5 recommendations, including the pros and cons of each. Hopefully, you can find the best model that suits your preference after these AR Blue Clean pressure washer reviews. This electric pressure washer is one of the most reliable and durable innovations by AR Blue Clean. It is designed to give the toughest clean for the driveways, patios, decks, and house sidings. It is also effective in removing grime, molds, dirt, and even discoloration on your garden space. The cleaning power of this product can deliver tri-axial pressure up to 2,000 PSI at 1.4 GPM. It comes with a 30 feet hose and 35 feet power cord that allows you to reach far areas. What’s best about AR390SS is it is easy to use, and it provides a professional-level cleaning result that will give your area a clean and fresh look and will make you feel satisfied. It is easy to assemble and easy to use. One purchase of the product contains all the necessary tools needed for pressure washing. The nozzle tips are replaceable. The AR390SS is powerful enough to clean even the dirtiest areas yet still gentle and does not cause any damage on surfaces. It works well without the unnecessary noise compared to other commercial pressure washers. It covers a full 1-year warranty for any manufacturing issues the consumers might encounter with the product. The hose is a little stiff and tends to coil up. I suggest you test this part beforehand and see if it’s something you can work with. This medium-powered pressure washer delivers a power of 1,900 PSI with a water delivery rate of 1.3 GPM. The machine is efficient enough to remove all kinds of grime and dirt on sidings, decks, patios, driveways, and more. Just like any other AR Blue clean pressure washers, this machine is strong in quality and meets the high standards when it comes to durability and performance. When it comes to noise production, this product can deliver an impressive cleaning performance without the unnecessary noise. Moreover, the AR Blue Clean AR383SS is easy to assemble and maneuver. This, in turn, makes your cleaning experience great. The unit has a 30’ hose suitable for working at a further distance without the hassle of moving the unit all the time. The unit is conveniently light, making it easy for the user to maneuver. It comes with smooth wheels for easy rolling. The AR383SS has a nozzle accessory storage to keep the nozzle tips handy and organized. It features a total stop trigger system which is helpful to avoid the accidental spray. The hose is stiff and can easily tangle. Some users find the hose reel difficult to roll up. The AR112S is a powerful electric pressure washer that can produce water pressure of 1,500 PSI at 1.4 GPM. It can be tough on stains and cleans even the dirtiest surfaces. This unit works great on small to medium areas both indoor and outdoor. It is also effective in cleaning cars, walkways, driveways, patios, and more, as per the comments of the other users. This unit produces more pressure than a typical garden hose yet it reduces water consumption by 80%. Also, the unit comes with an easy to use nozzle lance and spray gun. The AR Blue Clean stands by its reputation when it comes to safety, which is why this unit features the Total Stop System (TSS). It automatically shuts off the unit as long as the trigger is not pressed. Additionally, it aids in prolonging the life of the pump. This product is compact and easy to operate. It comes with a 20’ high-pressure hose suitable for easy cleaning on different angles. The AR112S is relatively quiet when in use. The TSS feature of this unit aids in preserving electric energy. This unit is provided with a full warranty for any manufacturing defects. The spray gun features a quick-connect for easy installation and removal of the lance, the hose, and the detergent bottle. Some users said that there are times that the unit does not produce water with its expected pressure. Beginners find the quick-connect feature quite challenging to connect accessories, thus resulting in leakage. This unit is my top choice among AR Blue Clean pressure washers. It can provide a maximum pressure of 1,900 PSI at a flow rate of 1.5 GPM, making it efficient in removing tough stains, grease, grime, and dirt. The AR383 is safe to use on enclosed spaces. It is also lightweight and compact making it easy for you to find storage space. It comes with compact wheels and with its weight of 27 pounds; the unit can be easily maneuvered from one area to the other. Its low-noise motor makes it comfortable to use without the worry of waking up the neighborhood. It has safety features like automatic pressure shut off, automatic safety valve, and the Total Stop System. If you are wondering what makes this one better than the AR383SS model, I’d say it’s the slightly higher flow rate that it produces. It has 1.5 GPM as compared to the 1.3 GPM of the AR383SS model. With the cleaning power of 2,850 CUs, this unit works great in cleaning the toughest stains easily. With its compact dimension of 11.2 x 12.2 x 28.5 inches, it can be easily stored in the shelf. The unit can be easily transported from one place to another with its transport wheels. Its Total Stop System makes it safe to avoid accidental direct sprays that can cause injury. The unit is not too expensive. It produces high-pressure water spray, but it is safe to use on stucco and concrete surfaces. It comes with storage for its accessories like cords, hose, and wands. The AR383 does not have pressure washing settings. The type and amount of pressure can only be adjusted from the nozzles, which I personally prefer since nozzles are versatile and easily available. The water inlet adapter is made from plastic, so it has a tendency to leak. The hose has a tendency to tangle. There are times that the hose reel does not work, making it difficult to wind and unwind. The AR240S pressure washer is a helpful tool for residential use. It has a maximum water pressure of 1,700 PSI and flows rate of 1.4 GPM. It can provide a cleaning job on cars, garage floors, home siding, garden furniture, and a lot more. Like any other AR Blue Clean pressure washers, this unit is made out of high-quality materials, and its durability is ensured. It produces 30 times more cleaning power while reducing the water consumption by 80%. It comes with an automatic safety valve, so you don’t have to worry about the dangers of using the unit. Also, this product comes with complete accessories which are necessary for a thorough cleaning experience. This product is extremely silent and does not produce unnecessary noise when in use. It is proven to be effective in cleaning rough surfaces and tough on stains including grease, mildew, rust, and oil. The unit is compact and lightweight and does not tip of easily. It can be easily maneuvered for different cleaning angles. The hose material is made from plastic, making it prone to leakage. The hose is stiff and makes it difficult to uncoil. Knowledge of the proper usage and maintenance of the AR Blue Clean pressure washers will make the unit last longer. I listed down recommendations from the Blue Clean pressure washer manual on how to properly care and store your unit to ensure the pressure washer’s maximum efficiency and performance. 1. After using the unit, turn off the power button, the water supply, and unplug the cord from the outlet. 2. Drain excess water by pulling the trigger of the spray gun for about 2-3 seconds and to release remaining water pressure. 3. Remove the high-pressure hose from the spray gun and unscrew the other end from the power washer. 4. Remove the lance from the spray gun and place the gun in the holster. 5. Discard remaining detergent from the trunk by flushing both the tank and nozzle with clear water. This is to prevent clogging and contamination of the detergent injector. 6. Secure the power cord by winding it around the L-shaped hook found on top of the unit. 7. The pressure hose can be stored on the hose hook found at the back of the unit’s handle. Proper storage of the pressure washer during winter should be observed to make the unit last longer. 1. The pressure washer should be stored indoors to prevent it from freezing. 2. If freezing temperatures cannot be prevented, you may opt to use an anti-freeze specifically designed for pumps. 3. You can also protect the pump by using a pump saver. A pump saver can keep the internal parts of the unit lubricated and prevent it from freezing. It also aids in preventing internal corrosion. Having the best AR Blue Clean pressure washer in the household is really life-changing. It is evident that owning one unit can help reduce the cleaning time. Among the top 5 AR Blue Clean pressure washer units, my best pick is the AR Blue Clean AR383. It might be a little expensive as compared to the other units mentioned; I am sure that purchasing the unit is definitely a good buy. Moreover, the cleaning power of the unit is powerful enough to get rid of the toughest stains. Also, the company takes pride in its excellent customer service, so rest assured that they will take time to listen and appreciate customers’ feedbacks. Lastly, if you actually want to save time and energy in home cleaning, just choose your favorite and give the best AR Blue Clean pressure washer a try today. Be amazed at how good the AR Blue Clean Pressure Washers can be!